Pianist Matthew Shipp's final album for Thirsty Ear finds him going about his usually adventurous trio business. Pianist Matthew Shipp has cut his final recording for Thirsty Ear. His name and the label's logo/font have been a pair for the better part of 20 years. Though the jazz heavyweight already had a sturdy recording career under his belt before signing to Thirsty Ear, he nevertheless used the label's stature to promote the new languages of jazz alongside colleagues such as William Parker and David S. Ware. But will his departure from the label really change anything in the long run? That remains to be seen. All we have to go on is Shipp's final bow before moving on, the unassuming yet delightful Piano Song. Like The Conduct of Jazz that precedes it, Piano Song is a trio album featuring Michael Bisio on bass and Newman Taylor Baker on drums. 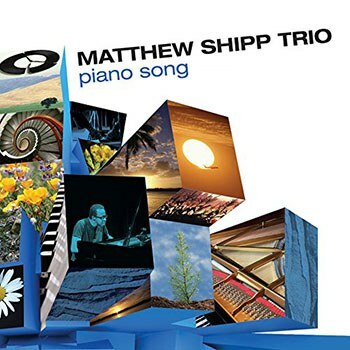 If you find yourself thinking "Oh, piano trio, jazz, I know how this goes," then you've obviously not come across the likes of Matthew Shipp. His approach to the piano isn't so much tuneful as it is orchestral, pulling melodies out thick, dense harmonies. Having Bisio and Baker along for the ride doesn't blunt this approach. He could have used this occasion, a final release for a particular label, as an excuse to show off yet another angle of his rare musical intuition, as he did when he celebrated his 50th birthday. But The Conduct of Jazz and Piano Song seem to suggest a sense of momentum in Shipp's way of thinking, and he's riding that train for all that it's worth. Piano Song starts with a short, solitary composition named "Links", only to be upturned by the heavily bopped "Cosmopolitan". By the third track, "Blue Desert", all standard piano trio bets are off as Baker uses only a shaker to lay the rhythmic foundation so that Bisio can experiment with his bow -- all before their boss ever makes his entrance. When he does, it's through delicate chord work, flying in the face of Bisio's oddly complimentary noise. On "Flying Carpet", Baker performs the beat as if he were backing a funk-rock band and not a jazz trio. The discordant melody that drives "Micro Wave" is just as memorable as any pop song, and "Scrambled Brain" is a very fitting title for the piece it adorns. Not all of Piano Song lays its cards on the table so abruptly. Some tracks move in more arcane ways, such as the hesitantly titled pieces "Silence of", "Void of", and the piano solo "The Nature of". As playful and enjoyable as they may be, good luck finding out what makes them tick. Piano Song concludes with a title track that sounds like Vince Guaraldi accidentally walked in on a modernist session where even the daintiest of figures manages to cast a shadow. It's tempting to wrap this up by saying that the song encapsulates Matthew Shipp as a paradox, but that's not entirely true. It's nothing more than a Beethoven quotation in action: "Art demands of us that we shall not stand still."